Some reasons I've fallen in love with Scotland although I've never been there. year and their impressions of the local residents and their antics. They described sheep, sheepdogs, life on a croft and the goings on in the local pub. I liked the book enough to read it twice which it a rare thing for me. I was almost ready to pack up and move to Scotland, but I had to remind myself that the book was written in the 1950s and things would be different now. While searching for a good book to read at the local library, I discovered the Hamish Macbeth mysteries. I’m a fan of mysteries that aren’t terribly violent and if possible, humorous. These books by M. C. Beaton were right up my alley. I read all of them, requesting them by inter library loan when the local library didn’t have them. I discovered when I got a new laptop that plays DVDs that there was a series on BBC of Hamish Macbeth mysteries. They did make some changes from the book, but still managed to keep the feel of the books with the landscape and character. I watched all of those too. There’s not a lot of Border collies or sheep in this series but like Macbeth, they share the love of the highlands and their village. The series starts when the son of the Glenbogle estate is tricked into coming back and stays to try to save the estate from bankruptcy. They wear kilts a lot on this show and who doesn’t like a man in a kilt? I liked the use of bagpipes in this series too. I didn’t recognize any of the overplayed tunes for bagpipes. They did not play the usual “Amazing Grace” at a funeral scene, but another slow, beautiful tune that fit the occasion. It seemed like a lot of the actors on the show could actually play the bagpipes.. 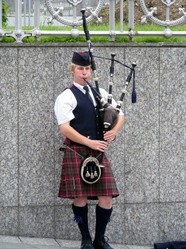 I may be fond of bagpipes because my dad used to play them. He was in a marching pipe and drum band and even has the official kilt and jacket that he bought during a visit to Scotland. It seems that our Jeffrey side of the family is considered a sept, or branch, of the MacDonald clan. I would love to live in a community that values sheep and sheepdogs. There aren’t many places left like that. I have had sheep, sheared them, washed, dyed, carded and spun the fleece and knitted and wove with it. Scotland almost sounds like where I should live. I like the music too. I’m not so sure about the weather, however, even though I’ve lived most of my life in New England. I think it would be too dark and cold. Not that I mind a touch of cold. I’m rather looking forward to winter down here in Texas. Serious cold is another matter. I love to garden too and it might be too short of a growing season for me. I think, sadly, that now I’ll just have to love Scotland from a distance. Where would you love to be if not where you are now? Ah, yes, the language barrier - hehe - I've seen translations. Too funny. A review of the 1939 movie starring Bonita Granville and Frankie Thomas.